An investigation by a group of Levenshulme parents into air pollution across the Manchester suburb has revealed shocking levels of air pollution, either approaching or over illegal levels. 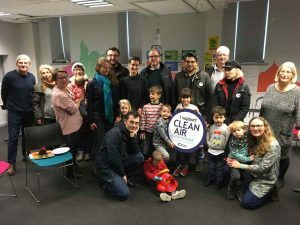 The results come as parents met at Levenshulme Inspire community centre (Saturday 1 December) to discuss local air pollution, and propose ideas to tackle illegal levels of air pollution in Levenshulme and across Greater Manchester. They were joined by local Councillors Dzidra Noor and Basat Sheikh. If air pollution levels were as bad all year as they were for the duration of the study this could mean that residents across Levenshulme would be blighted by illegally polluted air – including near schools and nurseries. The Levenshulme investigation started after local parents became concerned about air pollution and possible links to common breathing problems locally – including high incidences of wheezing and use of inhalers amongst babies and toddlers, and emergency hospital admissions. Parents and grandparents at local schools have also raised concerns with local Councillors about pavement parking near school entrances, with engines left ‘idling’, and heavy traffic potentially making walking to school unsafe and exacerbating the problem of air pollution. The parents group has monitored levels of nitrogen dioxide (NO2) in ten locations in Levenshulme, six in June 2017 and four recently in October 2018 . The four latest results published today (3 December) show that air pollution remains high outside schools and nurseries and is approaching illegal levels – including 38.3 ug/m3 outside Levenshulme High School for Girls – while on Stockport Road A6 two recordings found pollution well over legal levels, of 48.2 and 60.2, including outside a Dr’s surgery and leisure centre. The pollution was monitored for two weeks, providing a snapshot of NO2 pollution for that time. NO2 is a toxic gas which inflames the lining of the lungs. The legal annual limit for NO2 is 40 micrograms per cubic metre (ug/m3) but there are no safe levels of exposure to air pollution. “As a grandmother I am concerned for all children who have to negotiate busy roads and unsafe pavements on their way to school. Children are breathing in what is described by the World Health Organisation as ‘unsafe air’. This will have a detrimental impact on children’s health for years to come. Cars which park on pavements near schools are particularly dangerous as drivers often leave engines idling. “All the local council areas in Greater Manchester have illegal air pollution levels and we urgently need our council leaders to introduce the most effective measures to protect people’s health in the shortest time possible. 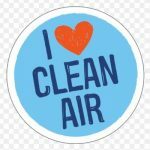 “According to Transport for Greater Manchester, road transport contributes 75% of emissions of nitrogen oxides and 81% of particulate emissions in Greater Manchester and our air quality plan needs effective measures to tackle this. Ideas supported by over 40 people attending the drop-in event included car exclusion zones around schools at drop off and pick up times; walking buses for schools; public transport improvements including integrated ticketing, cheaper, more reliable and more frequent rail services; safer walking and cycling infrastructure; and a Clean Air Zone to deter the most polluting vehicles from illegally polluted areas. 6. The results are from diffusion tube monitoring and provide a snapshot of the air pollution for the time and places that were monitored. They are not directly comparable to annual data, because over a year the weather varies considerably and level of air pollution with it, so the annual mean results could look very different. However, Manchester City Council’s annual monitoring station on Stockport Road also shows levels over the legal limit of 40 ug/m3 and therefore these results are supported by official council data.